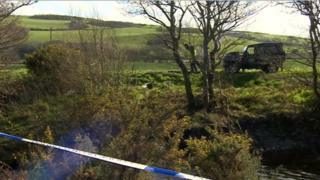 A 71-year-old man remains in a critical condition following a stabbing near the Borth Wild Animal Kingdom in Ceredigion. It happened at about 09:40 GMT on Thursday and the victim was airlifted to hospital. A 21-year-old man has been arrested on suspicion of causing grievous bodily harm. Det Insp Jon Rees said house to house inquiries would be made too. The large police presence in the area was likely to continue at the weekend. "This is a highly unusual type of crime to happen in Borth and indeed our force area," the senior investigating officer added. "I hope residents will feel some comfort in the fact that we swiftly made an arrest and are certain we are not looking for anyone else in connection with this incident." Tracy Tweedy from the Borth Wild Animal Kingdom said two police officers had been at the site dealing with an unrelated case at the time, meaning they were able to respond quickly to the stabbing. She praised staff, who took blankets to the scene and helped the victim. Mrs Tweedy said the attack happened in a popular dog walking area used by many locals.